Io Express is the perfect Mac or PC interface for anyone who needs a quality portable monitoring and mastering solution when working with Final Cut Pro X, Avid Media Composer/Symphony/Newscutter, Adobe Creative Suite, and more. Rugged and portable, Io Express delivers desktop-level functionality that's powerful enough to deliver in the edit suite, but sturdy and portable enough to handle life in the field. With support for a wide range of analog and digital HD/SD video and audio I/O, and broadcast-quality HD to SD down-conversion, Io Express fits into any workflow with ease. Compatible with PC or Mac, Io Express can be connected via PCIe card or ExpressCard interfaces, offering the flexibility to work on any platform, in the software of your choice. 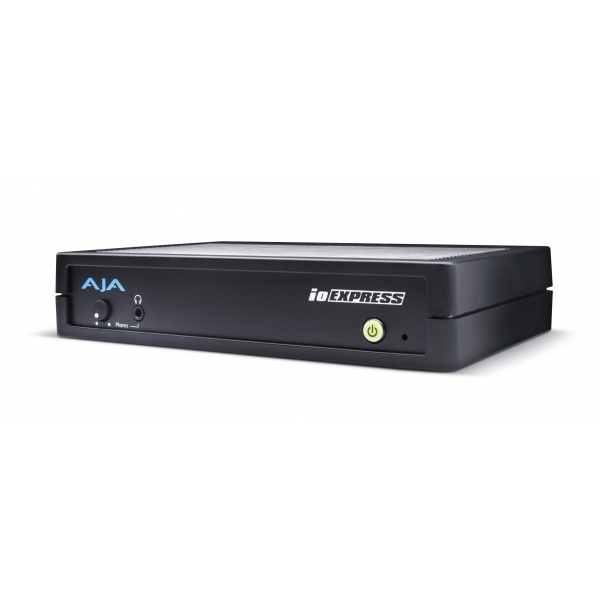 Io Express provides a wide variety of formats, frame rates and video/audio sources for the connectivity you need. For digital video, Io Express features HDMI 1.3a I/O plus 3G/HD/SD-SDI I/O. In addition there are connections for Genlock or LTC input and a loop-through output, and component SD/HD analog video output. The high-quality deep color HDMI input and output provides complete color representation when you need it, while allowing you to interface with HDMI camcorders and HD monitors. Io Express also offers support for both 8-channel HDMI and SDI embedded digital audio or 2 channels of unbalanced analog audio via two RCA connectors. For multi-channel audio mastering, the 8-channel SDI embedded 24-bit 48kHz audio provides pristine quality. However you choose to work, PC or Mac, laptop or desktop, Io Express can integrate seamlessly with your workflow. The same Io Express unit can be used with PC or Mac, desktop or laptop - giving users the flexibilty to choose how they want to work in each scenario. A rear panel PCIe connector enables use with laptops via an ExpressCard, or with a Mac Pro or Windows workstation via a PCIe card. With the ability to rack mount two Io Express units in a single 1RU space, you can have a secure setup while still having the mobility to change locations quickly. The RS-422 connection on Io Express enables control of external decks and other recording devices directly from within your software application of choice. Capture clips directly off tape and layoff sequences all frame-accurately without the need for a separate device control adapter. Io Express gives creative professionals the freedom to work with the software of their choice. 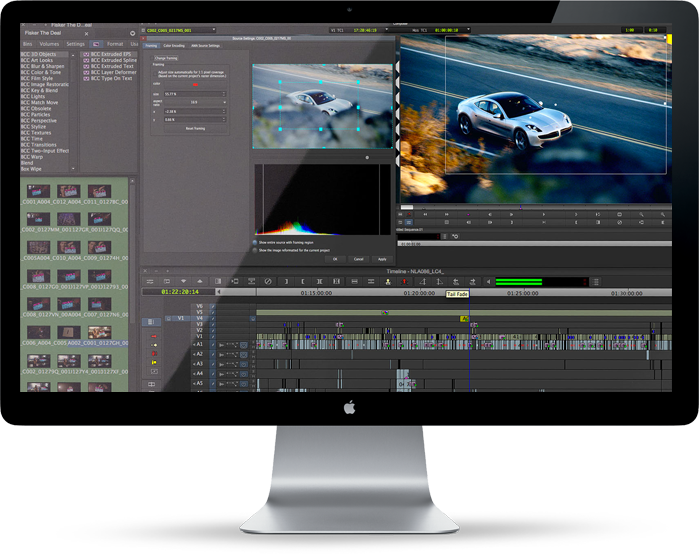 Mac OSX: Apple Final Cut Pro X, Avid Media Composer, Adobe Premiere Pro*, Adobe After Effects*, Adobe Photoshop* and more. Featuring full 10-bit, broadcast-quality HD to SD hardware down-conversion and automatic HD/SD 12-bit component analog output, Io Express offers conversion flexibility all the time -- during ingest or playback. Many situations require the editing system to be locked in sync with other devices. Io Express can accept a reference signal, which ensures it is locked to any necessary devices for the best quality capture and output. This reference signal can then be passed on to other devices. 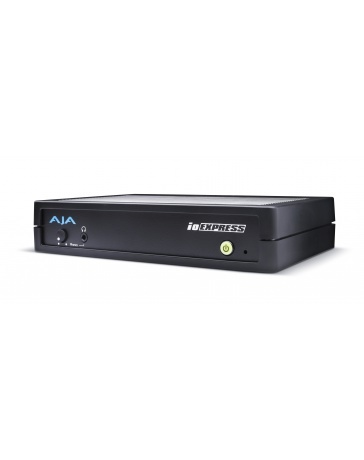 The AJA Io Express and Io XT Rackmount Kit (part number IOX-RM), is the perfect custom companion product when you are looking to efficiently rack mount one or even two Io Express or Io XT products side by side in your rack for studio, mobile truck or video assist needs. For longer distances between the Computer and the Io Express, you can purchase a 5-meter PCIe Tether Cable. AJA hardware is supported by an extensive list of professional software for editing, visual effects, graphics and more allowing the same AJA device to be used by many different applications on the same system. In addition, AJA provides several free applications that enable you to utilize the power of your AJA hardware even without having to run a particular software package. This allows you to create unique workflows without tying up valuable resources unnecessarily.